Guidance On How To Lobby Your MP For The Cannabis Debate. In the UK the only democratic power you have is through your MP. The arcane nature of our Parliament and the unaccountability of MPs makes that sad and depressing but it is reality. The only alternative routes to power are to spend millions on advertising and PR or to chance on gaining the fickle and unreliable support of the popular media. So, it is to your MP you must turn if you want to exercise influence in the cannabis debate. However poorly informed, bigoted or slave to the media your MP is, your role is to do what you can to inform and persuade. It is your responsibility to make your MP do their job and represent your views. Your Last Chance To Meet Your MP Is Friday, 9th October. The debate takes place on Monday 12th October in Westminster Hall. That means you must write, telephone and write and telephone again. Your MP works for you. You have a right to ask for their support and get a proper answer, not some standard, doublespeak brush off, drafted by the Home Office. Don’t accept such a response. You can also Google your MP’s name which will lead you to their personal website and more contact details. Most important is that you must include your full postal address and postcode to show that you are a constituent. Without this your email or letter will be ignored. Either an email or a letter is fine but you might want to consider doing both! Write in your own words. MPs are now wise to what they call ‘campaign emails’. The large number of campaigns by groups such as 38 Degrees have really swamped MPs with repetitive correspondence. It doesn’t work to send what is clearly a template or automatically generated email. You will just be ignored. Many MPs actually warn against this now on their website. 1. Legal regulation of cannabis will be much safer for everyone than the present criminal market. 2. £6 billion every year is spent on cannabis and it all goes to criminals. 3. I want to see cannabis available to adults only through licensed outlets with proper labelling and quality control. 4. I want to see cannabis taxed so that, as in Colorado, we can invest millions more in schools and hospitals. 5. Many people need access to medicinal cannabis for which there is now strong scientific evidence. 6. Please will you support and vote for legal regulation of cannabis? 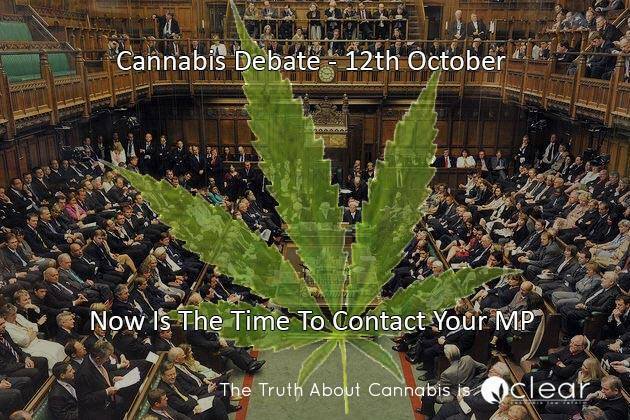 « Cannabis Debate On 12th October 2015. Now Is The Time To Contact Your MP.